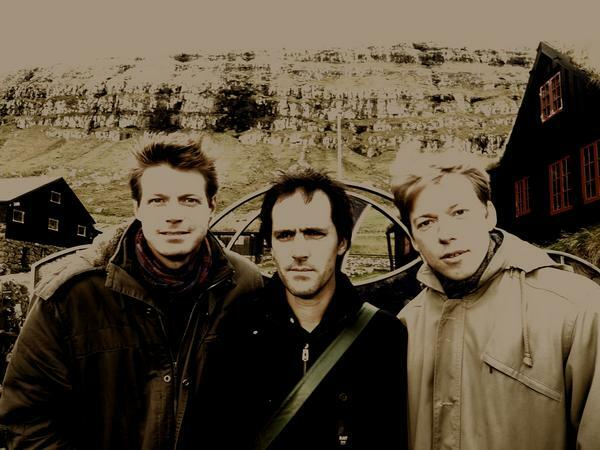 Starting this week, the Living Room Trio, a Nordic jazz unit, will tour in Denmark and they invited Makigami Koichi for the tour. Note: some sources says that November 1 is Århus and November 2 is Odense. Be sure to check beforehand. Makigami has already played with the trio in Norway so this tour is a sort of reunion for them. This time it will also be held a voice workshop of Makigami at a music school in Copenhagen, called Rytmisk Musikkonservatorium (Rhythmic Music Conservatory). It is a rare opportunity for European students so check it out. The institute's site is here (Danish, English). The Living Room moves in playful shuttle between superior improvisational abilities and lyrical tonal experimenting. The trio consists of three of the most highly profiled musicians, pianist Søren Kjærgaard, drummer Thomas Strønen and saxophonist Torben Snekkestad, and tonight they are extraordinarily visited by none less than Japanese vocal artist Koichi Makigami. Makigami has worked with John Zorn, Ikue Mori, Otomo Yoshihide and David Moss, and is known for his abnormal, vocal span combining age-old Japanese throat-singing techniques with experimental improvisational patterns. There will also be an album-release of the debut album from The Living Room, published at ILK. 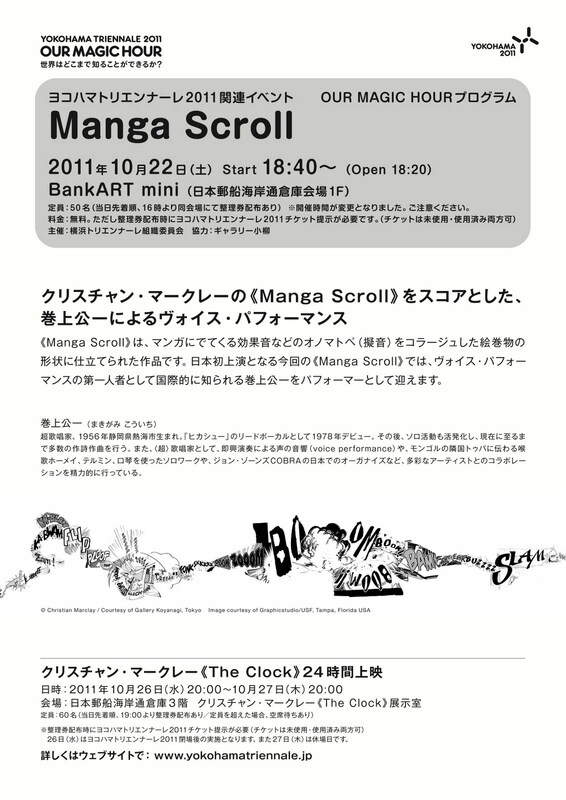 This weekend, a Christian Marclay's piece, entitled "Manga Scroll," will be performed in Yokohama. It is to be held as a part of the Yokohama Triennale and this is the premiere performance of the piece in Japan. 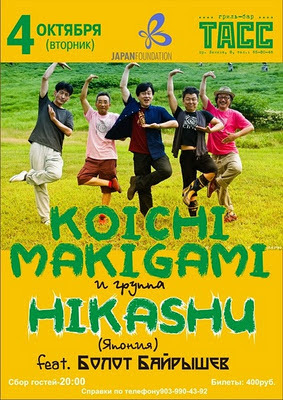 The work requires a vocalist, and the one whom chosen is no other than Makigami Koichi. The concept of the work is that the performer is to express oneself with voice while reading various words in the score, which is a long scroll with graphical onomatopoeias. Note: The numbered ticket for entrance is to be issued on 16:00 at the venue. 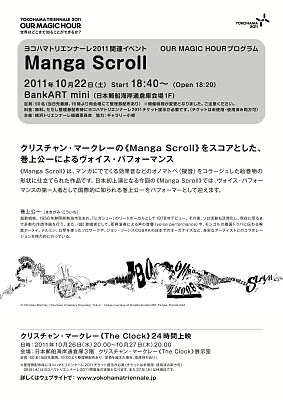 To obtain the ticket, you have to show a ticket of Yokohama Triennale 2010. For the venue and access information, see the official site of the Triennale. See the following clips to get what it's actually like. We all know this kind of thing is Makigami's field of expertise indeed. One more thing: Wallpaper, a UK's art magazine, will feature a lengthy article about Marclay in current issue and Makigami contributed it, along with the people like David Moss, Phil Minton, and Shierry Hirsch. The Russian Siberia tour successfully finished. Except for Makigami, all the members visited the country for the first time. They are utterly impressed with the people and the country, and hope to revisit there in the near future.